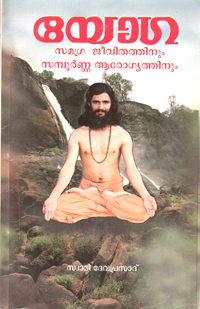 The Yogacharya Dev published three books. All these books are outcome of his rich experience, study and research in the field of yoga. 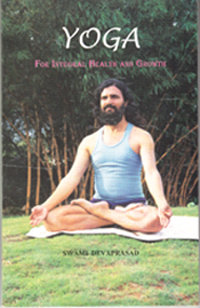 The first book “YOGA” (Malayalam) was published in 1995 by Dhyana Ashram, Kerala, India and the second book “YOGA for Integral Health and Growth” was published in 1988 by NBCLC Bangalore, India. 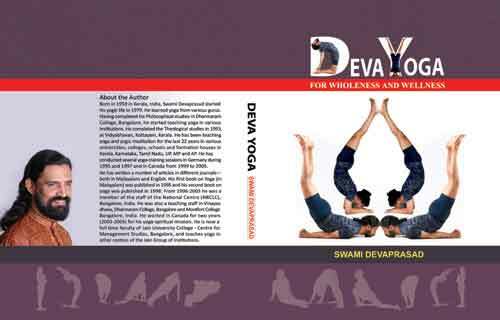 Book Deva Yoga is available for reference in The Ottawa Public Library. The world today stands in need of liberation, a new spiritual revolution that would transform the universe into a place of peace, joy and balance. Religions and philosophies that emerged to lead people towards these, most often end up dividing people, spreading hatred and vengeance. What we need today are spiritual-beings, not religious followers. Practice of yogic postures (asanas) and breathing (pranayamas) relax and prepare body, mind, and soul of a person to be receptive and open to the Divine Self, and to partake in the cosmic dance. The deeper awareness of the Universal Soul leads the person to contemplation and meditation, the perfect interaction of the Individual soul and the Universal Soul, leading to unexpressible joy, elevation of mind and body, transformation and transfiguration—a perfect union with the SAT-CIT-ANANDA –a life-long spiritual celebration. Yoga is the science of right living, and the way for the right physical, mental, emotional, psychic and spiritual growth. It is beyond religion and belongs to all Indians as its origin is pre-vedic or vedic. Thus, people of all religions, nations, and gender can gain the enriching and rewarding gifts from this ancient powerful spiritual tradition. Human being is essentially spiritual and born in a state of equilibrium. These childlike qualities get tainted, and imbalance creeps in with habitual interaction with the impurities of the society and nature. The disastrous toxins that accumulate in the body and mind result in stress, miseries and pain. Yoga removes these residues and unites the human being with others and the nature in a perfect bond of love, lead all living and non-living organism towards balance into a cosmic equilibrium and ecstasy. It is in the silence of the mind and the tranquility of the senses, people encounter the greatness of the self. Yoga helps control the body and master the mind to become submissive to the divine, and to become the divine itself. Our body is a boat to cross this world to reach the divine, where we came from. The boat shall be kept in good shape. The rows shall move in rhythm and beauty. And the goal is the other shore. Thus, the body must be pure and strong; breathing must be regular and rhythmical, mind shall focus on the celestial re-union with the divine. There should be a balance among all these three. Yoga is the art and science of mastering one’s mind, body and soul to reach divinity. The result is a joyful pilgrimage for the union of the individual soul (jiva-atman) with the supreme soul (param-atman). Desire is the cause of all miseries. Non-desire is the road to happiness. The outer calmness and inner serenity, the sheer joy that emanates from this, is the fruit of self-surrender and concentration that yoga advocates. Various asanas and mudras sooth mind and body. Rhythmic breathing relaxes mind and body. Scientific practice of yoga removes stress, increases physical strength, stamina, and flexibility, increases concentration of the mind and thus improves job performance, improves physical beauty with right shape and glowing and clear skin, increases aura and positive energy, accelerates intelligence and controls emotions, increases immunity and heals from all physical and mental ailments. Yoga was practiced by pre-vedic ascetics and imparted this knowledge to only deserving disciples. The power of yoga became confined to very few people. However, there is a yoga consciousness. From management gurus to beauticians, scientists to teachers, sports coaches to spiritual leaders, everyone advises practice of yoga. Yoga training centres have sprung up all over the world, most often converting this sacred practice to a booming business. As a yoga student of Swami Devaprasad, I can profess that yoga has been contributing enormously to my life, as a silent growth multiplier. This book would be a friend, teacher and guide to anyone who wants to take a pilgrimage along a “road less taken” towards the divine shores of eternal joy, truth and bliss. It is presented in simple, straight language, with pictures to help anyone to start practicing. Open the gates of your mind, and let Jeevatma and Paramatma seek for a divine union, a cosmic dance.